My favorite dishes seem to be the most simple ones, made with fresh and wholesome ingredients. When you are cooking with few ingredients it’s especially important to use only best ingredients such as HARVESTLAND® Antibiotic-Free Chicken, Turkey and Pork. I have partnered with HARVESTLAND® to share a money saving coupon, along with my favorite simple chicken recipe – Chicken with Goat Cheese and Sun Dried Tomatoes. HARVESTLAND® Antibiotic-Free Chicken, Turkey and Pork are pure and simple, just like your ancestors would have eaten. I feel good about feeding my family antibiotic free and purely all-natural fresh chicken and turkey products, available from HARVESTLAND®. They even have delicious Fully Cooked products available. I love that HARVESTLAND® products are conveniently available at my local Walmart store. Maybe it’s just me, but I think chicken without all that junk actually tastes better. I know it’s healthier for my family, so the fact that it tastes better too is a win, win. HARVESTLAND® products are the natural choice for your family, and HARVESTLAND® Antibiotic-Free Chicken is the perfect choice for my favorite chicken recipe. This recipe is so simple to prepare, you’re going to love it. Place butter and oil in a large skillet and preheat the skillet over medium-high heat until hot. Liberally sprinkle chicken breasts with salt and pepper, then place into the pan. Do not cover the pan. Reduce the heat to medium and cook until the meat is no longer pink and the juices run clear. This should take 8 to 12 minutes. As the chicken cooks, turn it occasionally so it browns evenly. If the poultry browns too quickly, reduce the heat to medium-low. The Chicken breasts are done when the meat is no longer pink and the juices run clear. While still in the pan, crumble goat cheese over the tops of chicken breasts. Top with sun dried tomatoes and fresh basil. That’s it. Easy peasy! *Chiffonade of basil is a simple stack, roll, and slice. Stack the leaves on top of each other, gently roll them into a cigar, and then use a sharp knife to slice them into thin ribbons. Nothing more than that! 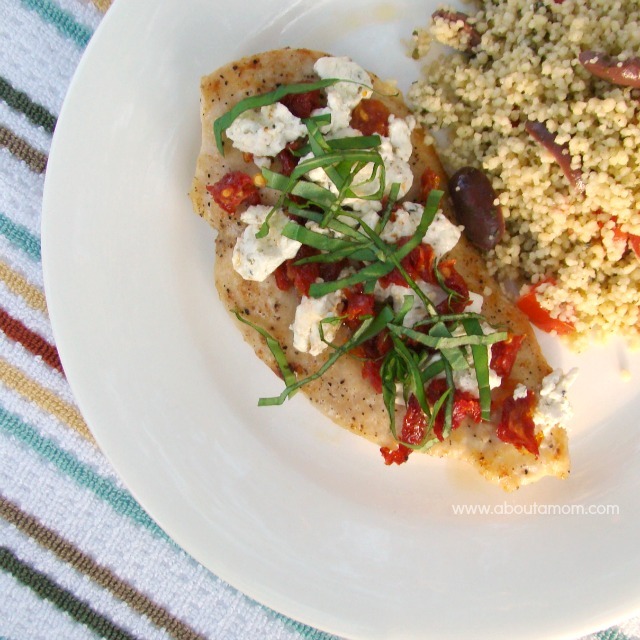 I most recently served up this chicken recipe with a couscous salad. It was a delicious meal! Do you love to save money? 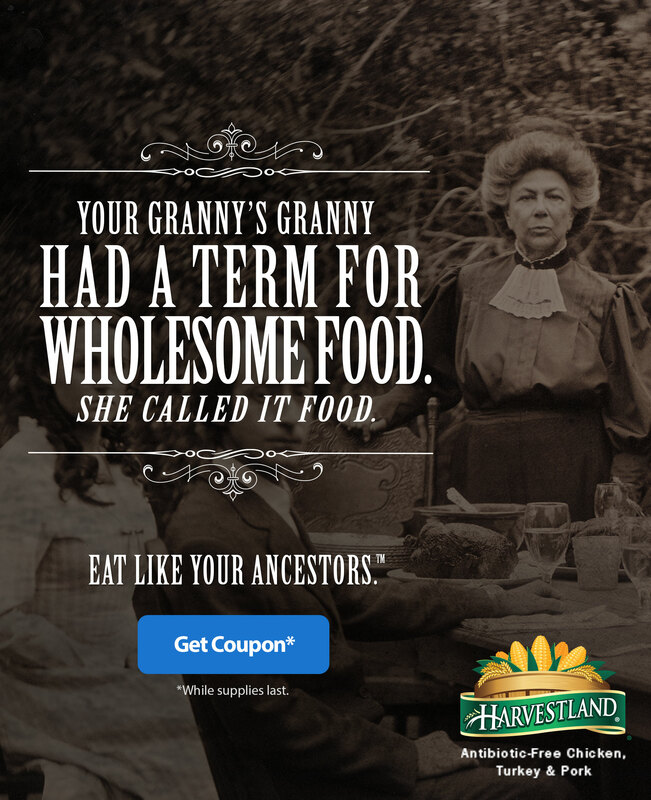 There’s currently a $1-off coupon on HARVESTLAND® products! Click the image above to get your coupon. This is a sponsored post written by me on behalf of HARVESTLAND® and I was compensated by payment. All opinions are 100% mine. What’s your favorite chicken recipe? While still in the pan, crumble goat cheese over the tops of chicken breasts. Top with sun dried tomatoes and fresh basil. That's it. Easy peasy! This looks so good and I love how you choose this chicken to use. I will have to try this recipe. Thanks for sharing. I love goat cheese and I especially like it paired with chicken. That dish looks so good and I am getting really hungry right now. I’ve never had goat cheese before but I love how you used it in this recipe. I’ll definitely be giving this a try soon. And, thanks for the coupon. Love simple recipes and goat cheese. This would be a winner at our house! This is a great combination: goat cheese and chicken.. Thanks for sharing. I love that HarvestLand is antibiotic free. That sounds delicious. I love meals like this that are relatively simple and have a lot of flavor! I’ve never heard of Harvestland Chicken before, but I’m going to have to search it out. I love all natural products. The crap that companies put into most non-organic foods is just frightening. We eat a lot of chicken and usually buy antibiotic free, so this is a good fit for us. Thanks for sharing the coupon! This sounds so good, I love simple meals! I am so not a fan of all the additives that go into our food. Blech! And, this recipe? Sounds awesome! I love the combination of goat cheese and sun dried tomatoes. This sounds delicious! Goat cheese and sun dried tomatoes go together perfectly, don’t they? I’ve actually had Harvest Chicken and I love it! We eat chicken like 4 times a week! One of my favorite brands of chicken! I’ve never even heard of sun dried tomatoes and goat cheese on chicken, sounds delightful! Oh my goodness, your recipe sounds and looks amazing. I love anything with sundried tomatoes and this is perfect. Thanks for the coupon too. Now I really really REALLY want to try goat cheese! lol. But seriously that chicken looks absolutely delicious! What a perfect pairing! Glad to see I’m not the only one who hasn’t tried it! I’d like to as well. I am going to have to look for the Harvestland Chicken! Love that is so much better for you and not so full of all the unhealthy junk they feed chickens in the big name chicken houses! I will have to see if I can find this somewhere! We eat the same old chicken every week. This looks like a great switch! Oh that looks really fresh and tasty with the toppings on there. I’m in love with sun dried tomatoes! That sounds really yummy! I never tried using goat cheese in my recipes, I will have to try it and see if my boys like it. This look delicious! I picked up some goat cheese on sale recently and have been wondering how to use it. That recipe looks amazing, I adore goat cheese! This brand of chicken sounds like they are trying to do things right! Wow, this looks really good. Thanks for sharing! Oh how fancy! This looks really good. What a great dish to make. I just saw this chicken and was thinking of trying it out. I am always looking for cheap and easy recipes to follow. Thank you so much for this one! I’m definitely going to have to try it soon. This sounds like such a great dish. Thank you for the recipe! I have never heard of this brand before. I am going to have to watch out for it, love how free of everything it is. Your recipe looks great too!! That looks simply delectable! I’m sure my son would love something like this. I love goat cheese! I will definitely have to try this recipe. We do not have Harvest Land chicken at my local store but it sounds like really good chicken. Thanks for sharing the recipe with us. I don’t think we do either…. I’ll have to check! Thin sliced breats are great for quick cook recipes. I buy the tenderloins instead of breasts. Chicken is the number one dish that I cook. Thanks for this new recipe to add to my collection! I have purchased this brand before. It is nice and fresh, I like that it’s organic. Your dish looks delicious. I am always looking or new recipes that include chicken. I love simple recipes, and that looks just delish! I love that HARVESTLAND’s chicken is antibiotic free. Chicken and goat cheese go great together! I’d love to pair the two. WOW that looks amazing. I need to try this on my own. This recipe looks delicious. Goat cheese makes anything better. I love that Harvestland’s chicken is antibiotic free. There’s too much of that junk in our food these days. I looooooove goat cheese. I have tried so many times to use sun dried tomatoes. I dont k now if its the brand I use or how I pair it but I just can’t get them to work for me. This meal looks so delicious and healthy. Definitely a tastier way to serve chicken and rice! Love chicken and goat cheese! Great picture, your food looks delicious. I’m not sure if I have ever seen Harvestland at my grocery store. I do love the recipe, especially sun dried tomatoes! This recipe looks fantastic! We eat a lot of chicken in our house – and I’ve grown to love goat cheese. This is the chicken I most often by for my family. Thanks for the recipe. I’m off to the store soon. Maybe I’ll pick up what I need to make this. That recipe looks amazing. I’m cooking chicken to night, I wish I had some of those ingredients to add to my dish, maybe next time! Thanks for sharing! I have never tried chicken like this. Sounds good and the picture certainly makes it looks GOOD. Hmm, I just might have to try it out! What a simple and delicious dinner! We often buy that chicken. That looks like a delicious recipe for this high-quality chicken. I prefer my chicken to be antibiotic free so I will look for this brand next time I am at the store. Love healthier chicken. Sun Dried tomatoes are fantastic. I love chicken! It looks really yummy. I’ll have to try this recipe. Thanks for sharing. I love anything with goat cheese. This is a simple, yet elegant dinner. What a yummy, easy recipe! We do one kinda similar with rice and spinach. We buy this brand and it’s great. Must try this recipe for dinner!!! 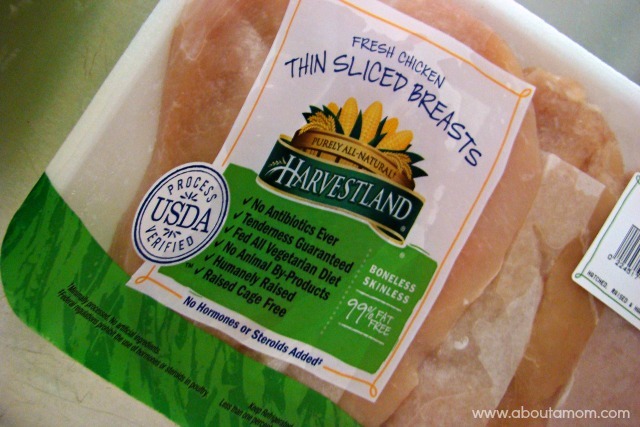 I’ve never heard of the Harvestland brand of chicken. That chicken recipe looks delicious. That chicken dish looks SO VERY good! I want to make this, this looks so easy and delicious. I am a total goat cheese fan so I am excited to give this recipe a try. Thank you for sharing it! I like how organic this chicken is. We are slowly going organic in our diets here, so this sounds like a brand I need to make the switch to! It sounds like a great recipe. I love that it uses goat cheese. This is my first time hearing of Harvestland Chicken. That recipe looks so delicious! I love this chicken recipe. We need to update our menus so it might make the addition. My current most prepared is baked. Not sure it’s my favorite but most often.. I always need new ways to cook old favorites. This looks really good. Oh my gosh this looks so yummy! I just ate dinner and this made me hungry lol I can’t wait to try this recipe! Thanks for posting! I agree with you–food without all the additives just tastes better. I have a few chicken recipes on my meal plan for next week, so I’m thrilled to save a little with the Harvestland coupon. That looks interesting! I never tried chicken with goat cheese and sun-dried tomatoes – I love the pics! This looks so good. My kids love goat cheese. I will have to give this recipe a try. Thanks for the tip. This recipe sounds delicious, I am going to use the coupon to go get some and make it for us one night. My daughter has wanted to make goat cheese but has yet to. I’ll have to tell her about your recipe. It looks amazing! We always purchase all natural chicken and I definitely feel it makes a difference. I will be pinning this mouthwatering recipe and adding it to our dinner menu very soon. This sounds like a healthy recipe. Thank you for sharing. My favorite chicken is a packet mix for chicken Dijon. I can’t find the mix anymore, maybe they discontinued it. Anyways, it was delicious and I haven’t found anything that comes close. Hi, I'm Angela, founder and content creator at About a Mom. I live in sunny Florida with my 10-year-old little girl. If you are seeking ideas and inspiration for family fun, mealtime, travel, or fun things to do in Florida, you will find it here. Please take a moment to explore this blog, check out my 'About Me' page or drop me a note. Get About A Mom delivered to your inbox daily!